Dimensions: 6-1/2 x 10-3/4 in. Kraft paper box with lid, 16 tri-fold notecards (4 designs repeating 4 times). 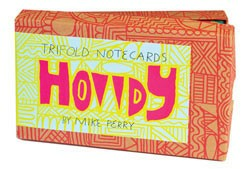 This all-new fold 'n' send notecard format features the distinctive and whimsical work of ever-popular pop culture illustrator Mike Perry. No envelope needed—just seal with a sticker and send.